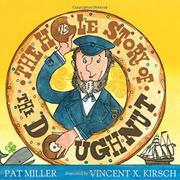 Miller shares the true story of the invention of the doughnut with the hole in its center. Hanson Gregory began his career at sea in 1844, at age 13, eventually captaining cargo schooners and clippers. As cook’s assistant in 1847, while preparing the usual deep-fried cakes for breakfast, Hanson had an idea. The sailors called the cakes “sinkers”: they were crisp at the edges but raw and greasy in the middle. Using the lid from a pepper tin to cut a hole in each cake’s center, Hanson fried a batch of cakes that “were brown, and sweet, and fully cooked. Sighs of delight rose above the noisy sea. A new breakfast tradition was born.” The author’s research unfolds a couple of colorful, alternate legends of the doughnut’s seagoing origins, since, naturally, “sailors like their stories bold.” Miller also recounts comments that Capt. Gregory made in a 1916 newspaper interview. “He laughed as he teased the reporter that he had invented ‘the first hole ever seen by mortal eyes.’ ” Kirsch’s charming watercolor collages liberally employ round motifs: on many spreads, the circular illustration on the right page is “cut” from the left, freeing up a circle of white space for text. Endpapers sport scores of holey doughnuts, many decorated nautically, and semaphore flags on the copyright page spell out “eat doughnuts.” Kirsch does not, however, take the opportunity to represent the racial diversity of 19th-century sailing crews.